Post sponsored by Mirum Shopper. All opinions are my own. I love beauty and healthcare products. I can talk about it endlessly. It’s just a passion of mine. As with so many other parts of life, things tend to come and go. New products and new brands start and end at a very rapid pace. While the latest and the greatest is always fun to keep track of, tried and true greatness is something I always love to embrace and celebrate! One of those brands that seem to have been creating amazing products forever has to be Dove!!! Loved by generations of women, Dove has been a positive force in their lives for 60 years. 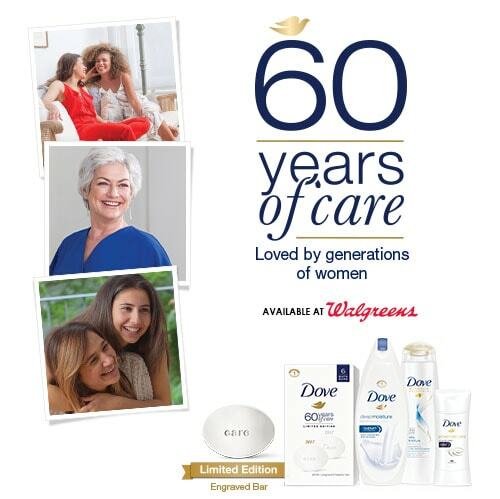 You read that correctly…it’s time to celebrate the 60th Anniversary of Dove!! Great products at great prices stand the test of time. Amazingly, after all these years, Dove is not resting on it’s success helping women look and feel wonderful. Dove is always innovating and coming out with new products, and they are not only about us ladies any more! Men are getting in on the Dove love and I couldn’t be happier. Men are able to take care of themselves better now, too with Dove Men+Care! My husband really likes the entire line. It’s awesome to see and no one seems to be celebrating all of this great news better than Walgreens!! 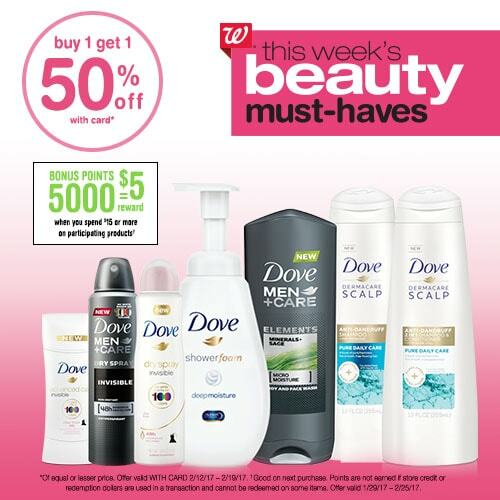 Walgreens is rocking a fantastic Beauty Must Have Event right now, encouraging everybody to stock up on Dove and Dove+Men products using a BOGO 50% offer and a Balance Rewards offer*. Talk about savings! Remember to check out the limited edition Dove products with words of encouragement and inspiration on them, too. I’ve always loved Dove’s mission for positive self esteem and I smile every morning when I get a little extra boost from my Dove Beauty Bar!!! I really love all of the new products, but really love the Dove’s Deep Moisture Shower Foam and Dove’s Women Clear Finish Dry Spray Antiperspirant the most. The antiperspirant is perfect for when I’m on the go and have a photo shoot! It leaves no white marks on 100 colors yet it’s tough on sweat, not on skin. Plus, I’m caring for my underarm skin with Dove’s signature ¼ moisturizers! The Dove Deep Moisture Shower Foam 13.5oz gently cleanses and cares for my skin with NutriumMoisture™ technology, delivering skin natural nourishment deep into the surface layers of the skin. Dove body wash instantly foams for a light, airy lather and helps support my skin’s natural moisture barrier as I cleanse. Bill is all about the Dove Men+Care Invisible Dry Spray Antiperspirant, which is just as awesome, and has the same great features, as the Dove’s Women Clear Finish Dry Spray Antiperspirant. The entire Dove line for men and women is amazing and you can’t beat the current deals at Walgreens! Stop into Walgreens to celebrate with massive savings right now!! To find out more, please check out all the amazing Dove products at Walgreens! Points are not earned if store credit or redemption dollars are used in a transaction and cannot be redeemed on some items. These are great deals! Thanks so much for sharing these. My entire family uses Dove. Their products are great. We shop at Walgreens at least twice a week. This is a great deal! I cannot wait to stock up on my fav Dove products! I love everything about Dove including their messaging. I so need to try that incredible looking new foam! Dove is a family favorite here! We shop at Walgreen’s frequently since there is always one within close proximity to where we are. I’ll be sure to stock up on these deals! This is a great way for us to get more Dove products using these deals! I can’ wait to drop by our local Walgreens and load my cart up with Dove. Dove is the only brand my husband and i use! I am headed there today to stock up! We love Dove. So I love finding it on sale, when I do I stock up! This is great, so many great deals at Walgreens! We ADORE Dove especially because of their focus on women. Women need all the support they can get! Walgreens and Dove…two of my favorite things. Walgreens never lets me down on great prices! I like Walgreens and I love Dove. I gotta go check out these deals. I need some shampoo and deodorant anyhow. Looks like a good time to head to Walgreens! Dove is always one of my favorite brands. Love the moisture and the soft scents. Now I need to head to Walgreens to stock up on my favs. I love the rewards program at Walgreens! Plus, Dove is a great brand so it’s a win-win situation when you buy them at Walgreens! I am a huge fan of Dove. I love their beauty bars so cleansing! The antiperspirant sounds interesting. I hate getting white streaks on my clothes. That sounds amazing! I think it’s great that Walgreens have special deals like this. I really love Dove’s products, from their soaps to their body sprays.